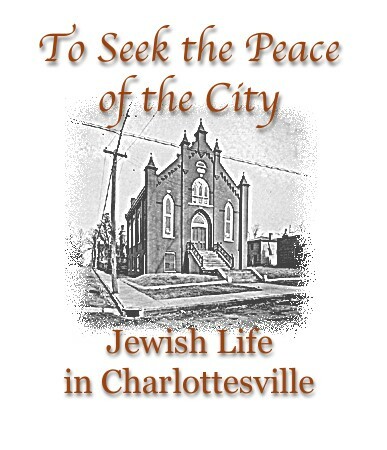 JEWS OF C’VILLE: Virtually every large and mid-sized city in the American South has had significant Jewish communities since the mid-19th century. Charlottesville, Virginia—the home of Thomas Jefferson, the University of Virginia, and Monticello (owned by the Levy family from 1834-1923)—is no exception. That was the point of a March 18 walking tour of C’ville led by long-time U-Va. History Professor Phyllis Leffler. During the tour Prof. Leffler looked at the Jewish families and businesses in that Central Virginia city, including U.S. Navy Lt. Uriah Levy (who was born in Philadelphia in 1792), who purchased Monticello in 1834. “To Seek the Peace of the City” is an expansion of a 1993 U-Va. exhibit, “Jewish Life at Mr. Jefferson's University,” which was presented as part of the University’s commemoration of Thomas Jefferson’s 250th birthday. Leffler included Uriah Levy’s nephew Jefferson Levy in her tour, as he spent considerable time in Charlottesville after buying out his uncle’s other heirs and taking control of Monticello in 1879. A committed real estate and stock speculator, Jefferson Levy (who sold Monticello to the Thomas Jefferson Foundation in 1923) bought and sold a good number of other properties in C’ville. As I noted in Saving Monticello, his first significant purchase in the city came in 1887 when he bought a building at the corner of Park and High Streets known as the Town Hall, which had been built in 1852. Town Hall, a large, three-story Georgian style brick structure, was used as a gathering place for local groups, traveling speakers and touring theatrical companies. By the mid-1880s, though, it had fallen into disuse. Jefferson Levy remodeled Town Hall and in 1888 renamed it the Levy Opera House. He enlarged the stage and put in a new orchestra pit with dressing rooms below it, inclined the floor to improve sight lines and installed a horseshoe-shaped gallery, new opera chairs and two boxes on the sides of the stage. The Levy Opera House hosted the first symphony orchestra that played in Charlottesville, the Boston Symphony, which came to town in 1891. That year Jefferson Levy leased the Opera House to Jacob (“Jake”) Leterman and Ernest Oberdorfer, sons of the founders of Charlottesville's German Reform synagogue. Leterman and Oberdorfer brought in other symphony orchestras, minstrel shows and various types of theatrical productions. In 1907, Levy leased the building to the Jefferson School for Boys, a small boarding and day prep school, for $400 a year. An addendum to the lease stipulated that if any theatrical performances were given in the Opera House, it “shall be advertised as the Levy Opera House,” and that Jefferson Levy retained the right to his box there. The school moved out in 1912. Two years later Levy sold the building, and it was subdivided into apartments. 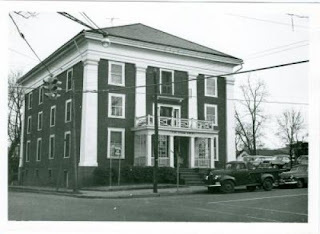 Today it has been remodeled into office space and is still known as the Levy Opera House. · Friday, April 6 – Talk on Francis Scott Key and the writing of “The Star-Spangled Banner” and book signing for the Daughters of 1812 Association of State Presidents annual banquet in Washington, D.C.
· Tuesday, April 10 - Talk on Saving Monticello and book signing at the ExxonMobil Spouses Club luncheon in Great Falls, Virginia. · Wednesday, April 11 – Talk on Saving Monticello and book signing at the monthly meeting of the Arlington House DAR Chapter, Arlington, Virginia. · Thursday, April 12 – Talk on Saving Monticello and book signing for the National Society of Colonial Dames XVII Century National Conference, Washington, D.C.
· Friday, April 13 – Talk on Saving Monticello and book signing at the Annual Meeting of Presidential Families of America, Washington, D.C.
· Saturday, April 14 – Field trip at the Monocacy National Battlefield Park for the Southern Maryland Civil War Round Table, Frederick, Maryland. · Sunday, April 15 – Talk on Flag: An American Biography at the annual meeting of the Daughters of the Barons of Runnemede, Washington, D.C.
· Friday, April 27 – 6:00 p.m. talk on Saving Monticello at the “Eat, Drink, Be Literary” event sponsored by the Hillsboro Historic Old Stone School in Hillsboro, Virginia. A fundraising event open to the public. For info email events@oldstoneschool.org or call 540-486-8001.